Here is an extensive look at Illinois Central from Centrailia, Illinois and southbound route to Wetang, Ill. The show visits all of the towns along the mainline. Filmed in 2003, there remains much ICRR power in service. The Paducah rebuilds have been replaced. 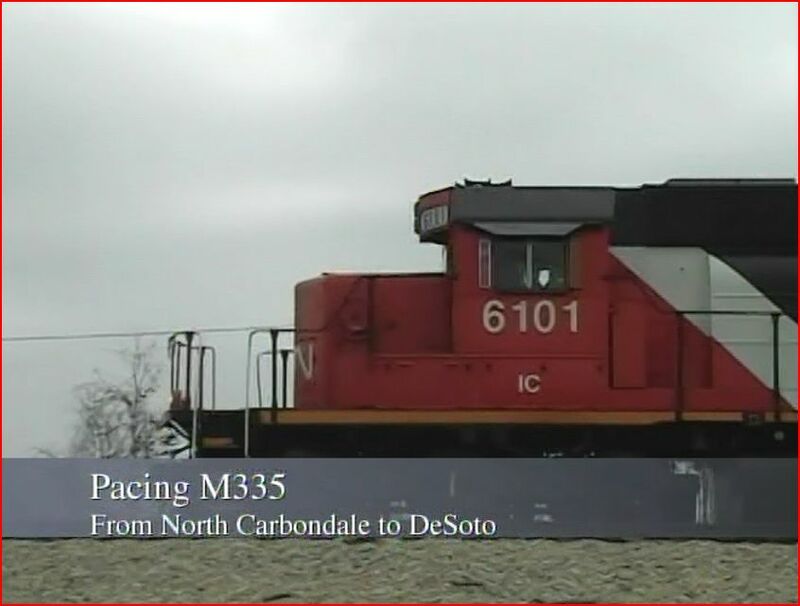 Standard SD40-2 and GP38-2 locomotives are the common Illinois Central diesels. Canadian National features many engines of various types. Amtrak, Norfolk Southern and Union Pacific trains are included. This release is a railfan train video. It is a basic video, that covers the advertised material. Extras are fairly minimal. They get the job done. An on-screen graphic identifies the trains. A map of the DuQuoin area is simple, and effectively used with the narrative. There is a chapter menu on the main menu page. The narration is a strong point of this presentation. Scott is descriptive, informative and concise. There are some tiny towns that we visit. Each one gets some shots of whatever constitutes, ‘the town’. A few succinct lines offer bits of history and comparison to the present. Noticeable, is the amount or lack thereof, regarding the coal traffic. Soft coal was a mainstay of the area economy. Branchines that once served a multitude of coal mines are nearly inactive in 2003. We begin at Centrailia, and get a fine tour of the IC facilities there. Surprised to see a roundhouse and a 2-8-4 locomotive display. There are the IC operations viewed. Long known as a hotspot, Norfolk Southern is seen here. A nice description which is the standard throughout this show. DuQuion is a larger town, with Union Pacific thru coal trains intersecting IC tracks. A great sequence of some UP coal moves, with the huge C44W type engines. 5899 is shiny new on the lead of a unit coal train. One train is full of assorted merged railroads: CNW, DRGW, MoPac hoppers mixed with Union Pacific. AN unrepainted Southern Pacific engine appears in a lash-up. Carbondale is another place with extended coverage. A Paducah GP11 and caboose are displayed at the station. Concrete coaling towers still stand. Desoto is also a highlight location, with many trains. This town has Union Pacific operating on a highline. A bit of night photography works out fine. Amtrak train 392 gets paced heading northbound, out of Carbondale, with locomotive #54 as the power. Here is a screenshot with the on-screen graphics. Wetaug is the final town on this show. It is as tiny as some of the others! The small towns get covered, one by one. The narration has commentary on everyone of them. No small feat, some research, or a very complete knowledge of the towns is apparent. Intelligent narration carries the lengthy program. In fact, the direction of this video is an interesting aspect in itself. One of the benefits of reviewing so many hours of programs, is seeing the talent. Cinematography, audio, script, editing, pacing etc… These elements must be combined in such a way, to make a quality train video. Larger companies have greater resources. The major players usually deliver at a high level. Smaller producers have to use limited resources, and this can reveal more of that person’s personality/ abilities. Consider that: the locales are not great scenically, operations/ equipment are rather mundane, as is this era. Now, get out there, film it, and come up with an interesting show. This has been accomplished. Using a variety of many trains, smart narration, live sound, multiple locations, and plenty of action to make a good show. Having Canadian National presence does add more interest. Some well done pacing scenes add more. The overall quality of the video is excellent. A tripod is consistently utilized. Natural audio is used, after introductory commentary. The microphone does record wind noise and a few vehicles. A handful of shots are distant, sometimes with autos in the foreground.The scenes are smoothly done and well edited. In summary, it is an amateur production vs. the big labels. This show is at the top tier of this level. 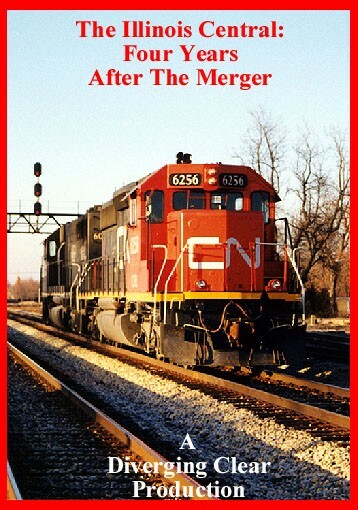 If you want to see modern era Illinois Central, even with Canadian National this will answer the call. Illinois Central: Four Years After The Merger, is an action packed show that should be on any fan of ICRR, and CNR lists of shows to see. This entry was posted in ATVR Reviews, Diverging Clear Productions and tagged American Train Video Reviews, Railroad, Train DVD by William J. Hudson. Bookmark the permalink.